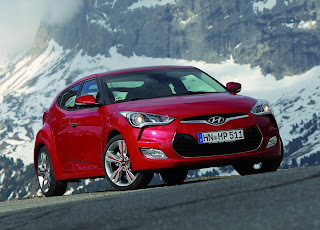 Hyundai introduced its cutting-edge Hyundai Veloster three-door coupe in a world debut at the 2011 North American International Auto Show. 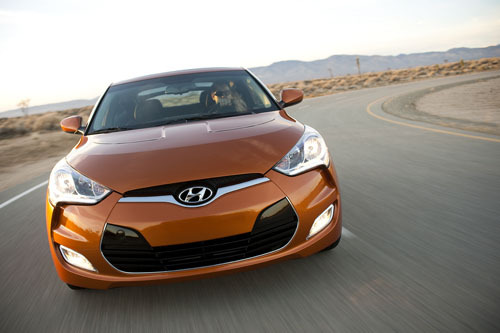 The 2012 Hyundai Veloster delivers innovation to the compact coupe segment with a unique third door for easy rear-seat access, Hyundai’s Blue Link telematics system, Pandora internet radio with seven-inch touch-screen display, and a new 1.6-liter direct-injected four-cylinder engine mated to Hyundai’s first dual-clutch transmission. Veloster’s unique design takes inspiration from a high-performance sport bike. 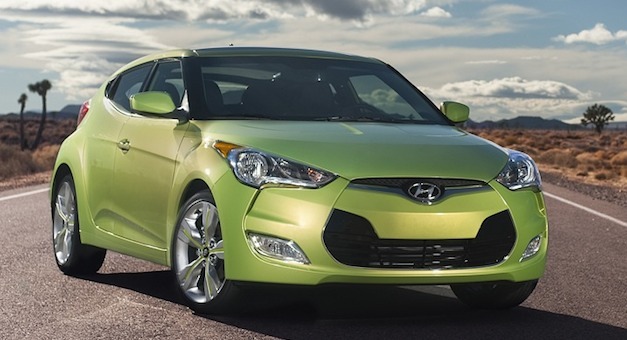 Hyundai Veloster has distinctive black A-pillars that give the glass a motorcycle helmet visor appearance. In the front is an aggressive form of Hyundai’s signature hexagonal front grille, hood scoop detailing, and unique Hyundai-signature LED position lights. 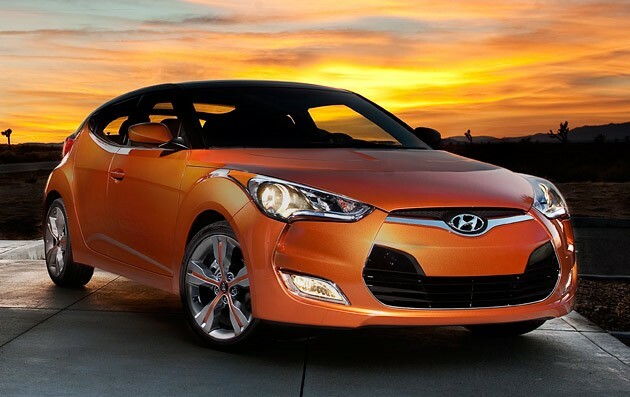 Optional packages add a chrome grille surround, piano black highlights, fog lights, and a massive panoramic sunroof. 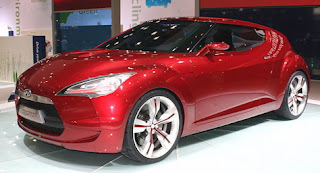 In profile the Hyundai Veloster features “Fluidic Sculpture” character lines, muscular wheel arches, bodycolor door handles and mirrors, and wraparound headlights and taillights. 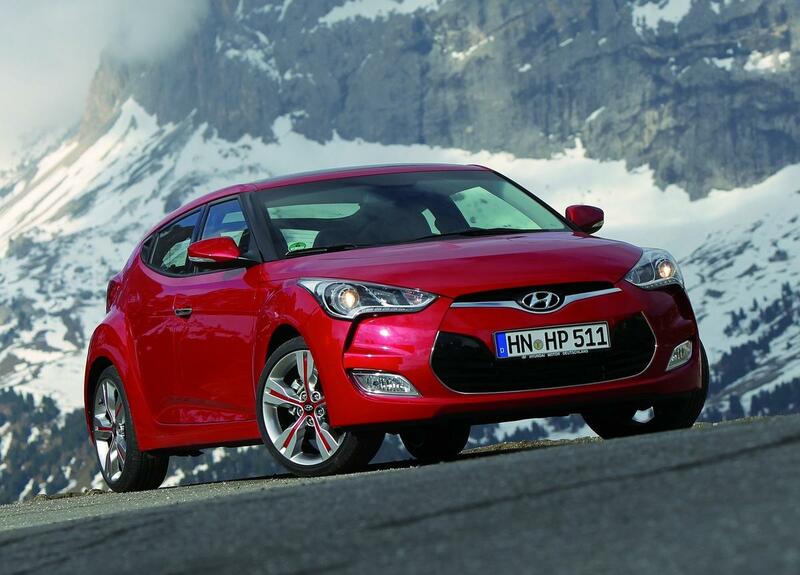 Hyundai Veloster comes standard with 17-inch alloy wheels and offers two types of 18-inch wheels. The top-of-the-line 18-inch wheel comes with painted inserts, a segment first. Hyundai Veloster's dynamic rear design has a distinctive glass hatch, dual centered chrome exhaust tips and black lower fascia that complements the assertive front fascia. Hyundai Veloster combines the style of a coupe and the functionality of a hatchback, while also incorporating an additional passenger-side door. In the past, some coupes have used smaller rear-hinged access doors. These coupes have always been compromised by having to open the driver-side door before the rear door could be opened, proving to be inconvenient for both the driver and passenger, and extremely difficult to operate in tight parking lot situations. Hyundai’s fresh take here implements a conventionally hinged door on the passenger side of the Hyundai Veloster, providing safe and ready access to the surprisingly spacious rear seats. The passenger-side rear door handle is hidden to maintain the coupe design.